Enter the name (to be drawn at the top of artwork), occasion (to be drawn in the banner), and any other content to be included, plus any preferences for design, colors, etc. OR, you can send me this info in a message when you have it ready. Your baby's first year goes by so quickly; take the chance to preserve this moment in time with a hand-drawn Favorite Things Poster™ that is a unique work of art! Purchasing this example chooses the size and materials for your drawing, and then I'll design your artwork with your own wording, colors, illustrations, etc. Your drawing can be based on the example, but will be completely unique since I create every drawing from scratch. I complete the drawing entirely by hand and send you the finished artwork. I use archival quality ink, not chalk, so the drawing will not rub off, fade, or discolor. The stretched art canvas measures 16 by 20 inches, and is about 3/4" thick. The edges are finished cleanly, so it's ready to use with or without a frame. The cost of the drawing includes any colors and layout, and simple illustrations. I welcome you to order as far in advance as possible to reserve your spot on my schedule. When you order in advance, I will contact you immediately before completing your drawing to get your updated content, so don't worry about ordering so far in advance that your child's stats will change. and acknowledge that you're aware of all the information provided in the listing(s) you purchase. 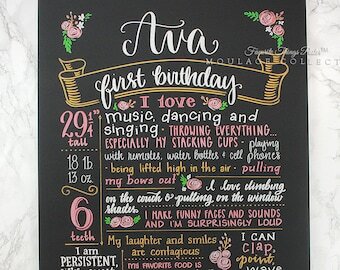 My daughters one year sign was exactly what I wanted! I had a great customer experience, Elizabeth was prompt to answer all my questions (which were a lot 😂), and my sign arrived early! Thanks for helping me create the best photo memories! This is my second purchase. I love it! Beautiful work as always! 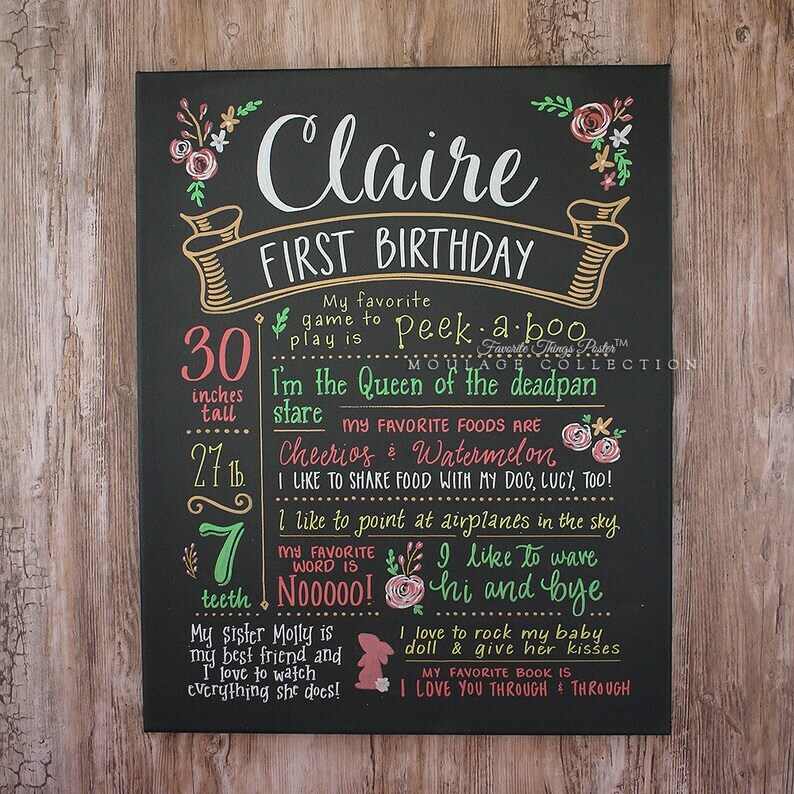 This is the 4th "first birthday" canvas I have purchased...one to celebrate each grandchild's #1 birthday. Highly recommend this seller. Great communication, timely delivery and the quality of the work is top-notch. There are some "copycat" people selling canvases but I would definitely stick with the original and order from MoulageCollection. To place your order for a custom artwork, purchase any example that is the size and materials that you want, and then I'll design your drawing with your own content. Placing your order with payment reserves your spot on my schedule. If you'd like to pay in installments, please contact me to set up your payment plan as far in advance as possible before your event. Custom artwork can not be returned or exchanged, but I will work with you to create an artwork that you will love. I encourage you to read my shop reviews to see how satisfied all of my clients are! Should you choose to cancel, an amount based on the work that has already been completed will be deducted from your refund. Damage caused by improper handling, purchasing the wrong item, or theft after delivery does not warrant a refund or replacement. This has never happened, but in the event of a personal emergency or if I am incapable of completing your order, I will give you the option to either receive it at a later date, or receive a full refund. If you have paid for earlier delivery and choose to receive it at a later date, I will credit the cost difference. I reserve the right to cancel and refund your order, in whole or in part, or deny business to anyone for any reason. I have never shipped an order late, but I cannot take responsibility for late arrivals caused by the shipping carrier, or other circumstances out of their control (such as delays due to weather), but can file a claim for reimbursement if it happens. Digital images, once downloaded or emailed, are not refundable, for any reason. • Clients in the US: Should damage or any other issue occur, please notify me immediately. Do not discard any items or packaging. You can choose to have a drawing re-made immediately, or a full refund after the claim has completed. It is up to the shipping carrier to determine if the damage is eligible for reimbursement. PLEASE DO NOT CONTACT UPS or file a claim yourself (if you do, I will not be able to offer you a resolution). • Should you choose to use USPS for domestic shipping, you must file the claim. Please designate yourself as the claim recipient; you can either keep the money as a refund, or purchase another drawing as a replacement. • International clients: In the event that your shipment is damaged or lost, I will do everything in my power to come to a resolution, but because the shipment is transferred to a local carrier for delivery, I cannot guarantee a replacement or reimbursement. I ship orders based on your event date, not your order date, to allow for updates. After I send the shipping notification with tracking number, the buyer is responsible for checking the tracking. Please tell me as soon as possible if your item is not delivered on the expected day, so that I can provide a timely solution. International shipping and delivery dates are estimates; there is no guaranteed delivery date from the shipping carrier. I use the example that you purchase as a starting point, unless you instruct me otherwise. Anything that you do not explicitly state will be left to my discretion. In addition to the colors that you ask for, I will use neutral colors, unless you request that I exclude them. Please don't assume that I know which aspect of the example you want copied on your drawing, and tell me what you want. I generally work "top down," so your content should be written in order of importance. You are responsible for proofreading your own content, although I will edit and correct grammar, spelling, and proper names. I will not include any wording that is crude or otherwise in poor taste, at my own discretion. I will not include copyrighted material. I do my best to provide accurate photos of each item, but drawings might vary in appearance from the examples shown. The more specific you are with your requests, the better I can meet them. It is the buyer's responsibility to review all photos, the entire description of the item(s) that they purchase, and my messages via Etsy's conversations, and to convey the information to the recipient if purchasing on behalf of someone else. Props in photos, including frames and easels, are not included with the purchase of a drawing. If you place your order far in advance of your event date, I will confirm the wording with you closer to the shipping date. All shipping dates are dependent on prompt communication from the buyer. "PROOFS:" If you would like to see a photo of your finished artwork before I ship, you must notify me when you order since this will add time to the process. All design decisions must still be made in advance, since major changes are not possible at this point. After I send the photo, you can pay full price for a new drawing if you want to make changes that are extensive enough to require me to start from scratch (essentially, the first drawing serves as your "proof" and the total cost is two times my regular price). Or, I can send you photos as I progress; should you request changes, they will be charged based on the amount of work completed. Progress photos are not available if you order less than 14 days prior to your event. I'd love to hear how you like your drawing! If you send me a photo of how you use it, or share it on social media sites, you agree that I may share the photo on my blog, Facebook, or other printed or electronic media as an example of my work, unless you instruct otherwise. I use many drawings as examples, and when I do, the wording on the drawing can be read by anyone who visits my shop. I might also include some details of our transaction for context, such as your first name. If you do not want me to share photos of your drawing, and/or certain details of our transaction, just tell me when you order and I would be happy to keep it private. All policies are subject to change without notice. While I will honor any information that was current at the time of your purchase, it must be in writing with that date. All other policies will be enforced as they currently appear. I am willing to make exceptions or do something differently if you ask! How do I place an order for customized artwork? To place your order for custom artwork, purchase the example in my shop that is the size and materials that you want. Since everything I do is custom, your artwork will not have to match one of my existing examples. How far in advance should I order? You should order as far in advance as possible. Placing your order reserves your spot on my schedule, and when you order well in advance, I'll contact you as we get closer to your event date to get all of your updated content for the drawing. How quickly can I get a drawing? You can choose your lead time from the drop-down menu when you add a drawing to your cart. If you don't have a deadline and would like to receive the drawing as soon as possible, I can usually have it to you within a couple weeks after you place the order.